The amendment also converted the SPT from a 15% ad valorem to a 13% specific tax, which means a specific amount will now be charged for a litre of petroleum product. The Volta River Authority (VRA) says Thursday’s shutdown of the Jubilee FPSO for routine maintenance will not affect the supply of power from the Aboadze enclave. The first of three planned shutdowns of the FPSO Kwame Nkrumah on the Jubilee field began on Thursday, January 1, 2018. The planned shutdowns are expected to make way for operators on the oil field to embark on a general maintenance exercise on the vessel. According to partners of the Jubilee field, the three shutdowns in 2018 have become necessary due to the recent challenges faced by the Floating Production and Storage Offloading vessel. There have been concerns that the shutdown will disrupt electricity supply, however, the statement from VRA states that it will put up to two turbines on Light Crude Oil (LCO) in combined cycle mode to generate up to 300 MW from Aboadze to support the system. “In addition, VRA will receive on demand, up to 200MW of power from La Cote d’Ivoire to complement generation,” the release issued by the VRA management said. The total net profit on the Ghana Petroleum Fund for January to September 2017 was US$7.03 million, according to a report by the Ministry of Finance on the Petroleum Funds for the 2017 fiscal year. Out of the total amount, the Ghana Heritage Fund contributed $5.20 million, compared to US$ 4.04 million in 2016, while the Ghana Stabilization Fund contributed US$1.83 million, compared to $ 0.65 million in 2016. The report said in the first half of 2017, the nominal US Treasury yields eased from the highs recorded after the US election, as the bill to repeal and replace the Affordable Care Act was unsuccessful in the face of political gridlock. The report said the yield of the US 10-year Treasury note ended the first half of 2017 at 2.304 percent, compared to 2.444 percent at the end of the second half of 2016, while the yield of the two year note ended the first half of 2017 at 1.382 percent, compared to 1.188 percent at the end of the first half of 2016. On the outlook for 2017, the report said the global economy was expected to grow at a pace of 3.4 per cent in 2017, up from 3.1 per cent in 2016. It said growth forecast for the United Kingdom had been lowered from 2.0 percent to 1.7 percent for 2017, due to tepid performance of the UK economy and lack of clarity on the ultimate economic impact of Brexit. Touching on developments in the upstream petroleum sector in 2017, Mr Emil Addae, Production Engineer at Ghana National Petroleum Corporation, said crude oil prices have remained relatively stable, while the output is increasing as a result of production from the new fields in 2017. Mr Addae said the total petroleum receipts that are proceeds from liftings and other petroleum receipts as at September 2017 was $362.58 million dollars, which compared with the receipts of $172.92 million for the period in 2016. He said the total amount transferred between January to September 2017 from petroleum liftings and related proceeds to the Annual Budget Funding Amount (ABFA) was $127.09 million. Mr Addae said out of the total ABFA amount transferred, $6.92 million was allocated to the Ghana Infrastructure Investment Fund in the first quarter of 2017. On the way forward, Mr Michael Asare-Akonnor, an Economic Officer at the Ministry of Finance, said the final determination of the Ghana-Cote d’Ivoire maritime boundary dispute by International Tribunal for Law of the Sea on 23rd September 2017, expected that all the previously affected companies would resume normal operations to implement their work programmes under their respective petroleum agreement. He said work was on-going for the drafting of the petroleum regulations to provide operational details for the Exploration and Production Act and explain how the Act is administered. Mr Asare-Akonnor said the draft Petroleum Revenue Management Act Regulations was almost ready and would be laid in Parliament before the end of 2018. Fuel consumers will from Friday December 1, 2017 be insulated from paying high cost of the commodity at the pump. This is because government has decided to stabilize prices of petroleum products under its price stabilization mechanism captured in the Energy Sector Levies Act 2015. As a result, all OMCs and LPGMCs have been notified by the Petroleum Regulators, NPA, to review the prices of the products in line with the revised Price Stabilization and Recovery Levy (PSRL). Per that revision, a litre of diesel which currently sells 10 GHp will now be selling at 3 GHp. The price of LPG will also be revised by that same margin. Petrol which is selling at a litre price12 GHp will remain unchanged. One of the main determinants of fuel prices on the international market is the crude oil price on the international market. Due to the fluctuation in prices of the commodity on the international market, consumers in Ghana suffer many price hikes even when the local currency is relatively stable. Consumers in Ghana have recently been enduring price hikes in petroleum products on account of increases in crude oil prices on the international market. In an attempt to stabilize the prices, the Energy Ministry directed the NPA to activate the Price Stability and Recovery Levy (PSRL) under the Energy Sector Levies Act 899 which is to provide stability for consumers at the pump in times of rising prices of petroleum products on the international market. (1) The minister shall submit an annual report on the Petroleum Funds as part of the annual presentation of the budget statement and economic policies to Parliament. he Africa Centre for Energy Policy (ACEP) is urging the Minority in Parliament to revise its current posture towards attempts to review Ghana’s power agreement with AMERI. ACEP is of the view that the contract was overpriced and must be investigated without partisan considerations. The Minority in Parliament, last week went ahead with a planned boycott of deliberations on the urgent motion for a reversal of the AMERI Power Agreement by the Mines and Energy Committee. It argued that, the motion was not debated on the floor of Parliament before being forwarded to the Mines and Energy committee. But the Executive Director for ACEP, Benjamin Boakye, said the minority’s boycott will not promote an effective probe of the agreement. “If this new government wants to do something similar, how will the minority be able to critique it? I think they should all be part of the process and allow KT Hammond to have his right and activate the processes of parliament. If you have challenges with that, you have to point it out, rather than walk out to allow only the majority to have their way in the manner that it is turning out,” he said. K.T. Hammond, who was the ranking member of the Energy Committee of Parliament in 2015, when the deal was approved, filed an urgent motion seeking to reverse the deal due to his conviction that the deal was not value for money. The John Mahama administration in 2015 agreed to rent the 300MW emergency power from AMERI at the peak of the country’s power crisis. As part of the agreement, AMERI was to build the power plants and operate them for five years before transferring it to the government. The deal received parliamentary approval on 20th March, 2015. But subsequent details suggested that, the government may have been short-changed by AMERI as they presented an overpriced budget. Parliament is reconsidering the deal to possibly reverse it if evidence of the state being shortchanged is found. Meanwhile, former Minister for Power under the John Mahama government, Kwabena Donkor, has warned that reversing the deal will lead to a dip in foreign investments into the country. A former deputy Power Minister, John Jinapor, has also called on the Member of Parliament (MP) of Adansi-Asokwa, K.T Hammond to seek redress in court if he wants to challenge the validity of the AMERI deal. Liquefied Petroleum Gas (LPG) marketers say they have started supply of the product at retail outlets with immediate effect. The move they say is to ensure uninterrupted supply of gas across the country. 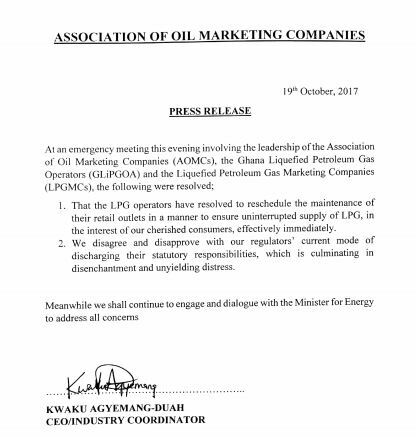 The decision to resume operations, according to the Association of Oil Marketing Companies, was reached after an emergency meeting with major players in the sector on Thursday, October 19, 2017. The operators shut down their business for two days to, according to them, enable maintenance works at their outlets and to ensure compliance with safety regulations. The shutdown of LPG outlets caused a shortage of gas in some parts of the country.